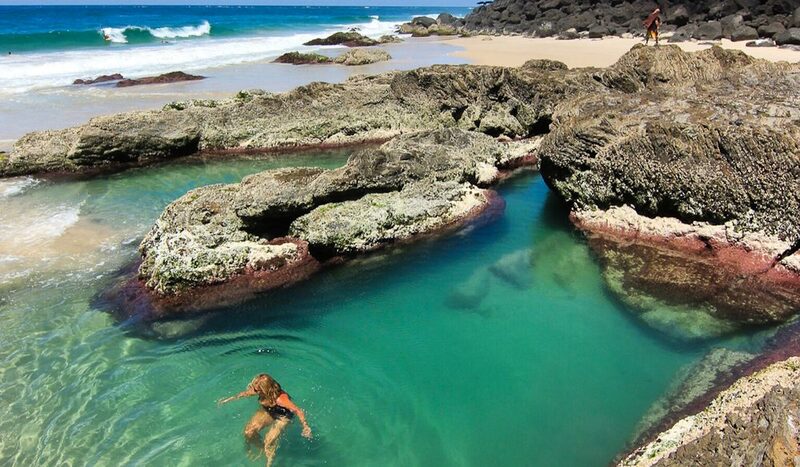 A dip in Rainbow Bay's quiet rockpools (photo: Shelley Kay Photography). Rainbow Bay, the pot at the end of the less-developed Gold Coast, is number 91 on Australian Traveller’s ‘100 amazing places you haven’t been to yet‘. Nominated by: Li Cunxin, dancer for Queensland Ballet. Stop thinking of Surfers Paradise and the Gold Coast as interchangeable, says Li Cunxin: Rainbow Bay might be part of the world-famous shoreline, but it’s “beautiful, less developed and very family-friendly,” he says. His ultimate day here starts with a walk along Rainbow Bay (possibly stopping to watch the pros surf nearby favourite, Snapper Rocks), then having a coffee at Café DBar – “fabulous views and nice coffee; homemade muffins to die for,” he says. Next is a swim, or watching kids playing cricket on the beach, followed by a movie at Coolangatta Cinemas, where they bring your latte “straight to your seat” (! ), before you farewell the day with a sunset drink at Rainbow Bay Surf Club. After a lazy dip in the pretty rockpools, we’d advise. Cobbold Gorge: the most gorgeous of the gorges?